What’s new in Audi A4 Premium Sport… Find Out. The German luxury brand Audi has added the sporty sensation to the exiting sedan A4's nomenclature with an "S Line Logo" by launching the Audi A4 Premium Sport edition. The premium "S" version of the flagship A4 is christened as the Audi A4 Premium Sport; featuring an array of sporty features in the car. A4 Premium Sport edition, the new entrant to the Audi’s existing stable, has been stacked between 'A4 Technology Pack' and the top-end 'A4 Premium' variants. 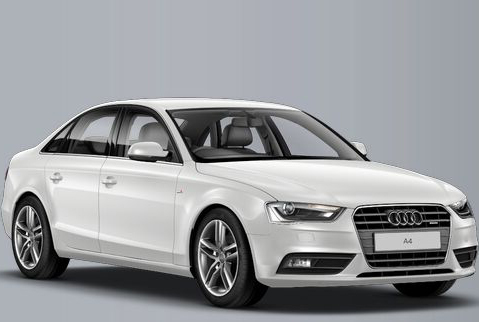 The A4 Premium Sport is available at a starting price of Rs. 38 Lakhs (ex-showroom, Delhi). According to Audi, the A4 Premium Sport is an ideal balance between performance and efficiency, sportsmanship and sovereignty, intelligence and emotion. Under the bonnet, the A4 Premium Sport edition features the proven 2.0 Litre four-cylinder TDI diesel engine, with a power output of 175.6bhp at 4,200rpm and peak torque of 380Nm between 1,750-2,500rpm. The engine is paired to Audi's Multitronic CVT automatic transmission; which can touch 0-100 Km/h in just 7.9 seconds. Audi claims a decent fuel efficiency of 17.11 Km/L for the A4 Premium Sport. Apart from the redesigned bonnet, "S line" exterior package, glass sunroof & sporty all-black interiors; the A4 Premium Sport features the carbon-black styling kit comprising of all-black electrically folding wing mirrors with memory; window sills and door moulding. The interior of the car also bares sporty all-black looks. The Audi A4 Premium Sport is likely to be a limited edition car and will be available only in two traditional Audi colour options – the Misano Red and the Ibis White. Suzuki Baleno: Riding high on hopes!